Remember those hearts I made for Valentine's Day? Well, I think I have a crush on book page mosaics now. I also have a crush on sad guitars. Sad guitars, you ask? Yeah, like the ones Karen Carpenter used to sing about. Or George Harrison. Or Brian Pounds. 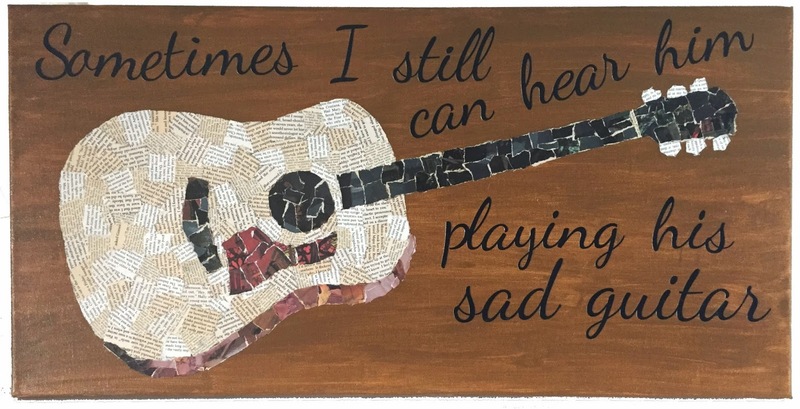 So book page mosaics + sad guitars = this new creation. It's a lot bigger in size than those 8x8" hearts were. This baby measures in at 30x15". I used the same combination of book pages that I used for the hearts for the face of the guitar, but the other parts needed some color, so I used some RDCB pages with pictures for the sound hole, bridge and pick guard. It was fun going through pages trying to find just the right colors to use in my "palette." I've got stacks and stacks of pages that are primarily black. But the cool thing is that when I tore them into pieces, the edges are white. I thought it was such a neat effect on the neck of the guitar. They almost look like frets. So sad guitar = happy Stephanie. I've got tons of ideas for new mosaics now, and I can't wait to get started!